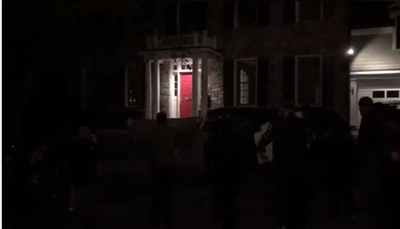 Protestors did not merely gather and shout outside @TuckerCarlson's home. They broke his oak front door while his wife was home alone. She locked herself inside the pantry to call 9/11 because she feared a home invasion. Tucker Carlson says “activists rang his doorbell, broke his oak door and one protester was apparently caught on security video mentioning a pipe bomb.” One of those things is true. The doorbell. In speeches, the right-wing mail bomber, was mentioned.